If this is the first post you are reading I have a goal of making $1000 during the year on the internet doing things I enjoy in my spare time. There cannot be any commitment, I have to be able to do things whenever I feel like it, stop for long periods of time if I want, and cash back sites and contest winnings do not count. I have to have received the money either in the form of gift cards or PayPal. I have been trying for over two years and this is the first year I think I am going to be able to meet this goal. It is not a fast process but it can be done. I know it is possible to make a lot more but I still want this to be a fun hobby not a job. Other people pay video games to relax I do micro tasks for money. I am also a really good deal finder so that extra $1000 can get me a trip for 2 to Vegas with shopping and eating. A quick update on my life I quit my job went to a web development boot camp at a school that markets itself as not a boot camp. I finished the course but I wasn't good at web development the school wasn't for inexperienced people even though they market it that way. I am currently looking for a job which should mean that I have a lot of time to increase my internet earnings but I am actually spending less time since I used to do a lot on my commute. I am fortunate that I am financially able to take a bit of time off from working but to be comfortable with no income I had to reduce my lifestyle spending. I am glad I have a hobby that allows me to earn money doing things I enjoy to treat myself while I look for a job. The internet changes very quickly things that were on top of my list a few months ago are now on the bottom so here is a revised list with links. The referral links are listed if the sites have You do not have to use the referral links companies will often give you a freebie for signing up with a referral link. This continues to get better the more that I do. A lot of people say more tasks open up once 100 , 500, 1000, 5000 hits (work items are completed). For me this has been true I could barely make $1 before I had done 100 and after 500 I noticed a jump right away. The increase is also a result of my approval rate increasing. 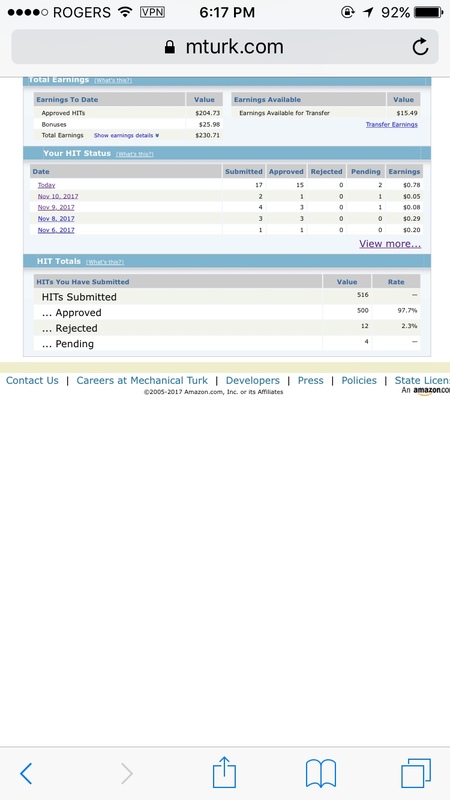 I still have a low percentage at 97% but its getting better 99.9% is considered good in the mturk world. I really enjoy being behind artificial intelligence progression. I only do things I enjoy so I do things like rating profile pictures, surveys, typing words in boxes, and transcribing business cards. Those are things I like but there are thousands of different things that can be done. I love being able to choose what I feel like doing at anytime of day. I have joined an mturk facebook group and people on there are making over $100 every day. I don't have that kind of patience and also at a disadvantage as a Canadian. There is more work available to Americans and they can transfer earnings to their bank accounts. In Canada we get amazon.com credits but I have been getting Whole Foods gift cards with my earnings it has been working great for me. My year to date earnings currently is $260 and I am confident I can get to $300 by the end of the year. This is US dollars so the exchange rate increases the value as well. Unfortunately they are not accepting any new people right now. A new worker site is being launched in December so I am not sure what this change will bring in the future. I still really enjoy this site just because of the variety of things that are available to be done and I really hope it is around for a long time. If you want to sign up expect that it will be awhile before you are accepted I was initially rejected and approved eight months later. I found out about this from the mturk community. This is an academic study site based out of the UK. The surveys pay really well. I joined 3 weeks ago and have already made $20 British Pounds which is $35 Canadian dollars. Only $5 is needed to cash out I tested as soon as I had the minimum and the money was in my PayPal within one day. The only problem with this site is there aren't that many surveys you have to keep looking to see if something is available to do and often things come out late at night. I like that the surveys don't take very long, they are usually interesting, and there is no rejection rating. I have only been using this for a short time but I highly recommend it. There are many different things that can be done on swagbucks to earn money. I mainly use it as my search engine, answer a daily poll, and play mini games. These are things I find easy to do there are a lot more things that can be done. In addition this is also a cash back site. I don't use it to its full potential but I do earn around $25 in gift cards a month. There are many different gift cards and paypal that you can get with Swagbucks. I usually get starbucks giftcards because I go to starbucks and the giftcards go on sale often. The surveys on this site pay really well usually around $6 for less than 15 minutes. The problem is there are not very many surveys available and when they do come out they are taken quickly. The surveys are targeted towards immigrants of certain nationalities so this site is not for everyone. This is an app where you can watch short ads to get free spins. You choose blue or gold and its possible to win money. There are also live games where you win money depending on how many rounds you get through. They keep updating this app and it keeps getting better. I haven't been very lucky with this I make around 0.10 per day there is potential for $200 if you choose the right colours. Its still fun and there is potential with the changes that are coming that this will get better. I would only recommend this if you have good internet and a good phone plan as this app takes up a lot of data. It currently works on android and iPhone I am not sure about others. This is a research company owned by Nielson. They put out surveys that take 15 minutes and pay $3 about new products. This used to be one of my favourite sites as they never kicked you out in the middle of surveys. Now they have changed their format you have to answer qualifying questions right before the survey and some of them are long and you then don't qualify for the survey. The other problem is there isn't very many surveys and I have noticed the survey format coming up on other sites like mturk which makes me think the research might be going to other sites now. I did have a survey this morning that didn't have a qualifying screener so hopefully they will go back to the way things were in the past. The advantages of pinecone is you only need $3 to cash out to paypal, they pay quickly, there are no paypal fees and sometimes you get lucky and they send you free products to test and earn more money with. This is going up on my list as there are usually surveys available and it hasn't kicked me out in the middle of surveys for awhile. I still don't use this much just because of the past but lately it has been good. The extra bonus with this is there is always a game to play at the end of the survey to win prizes. I still haven't won anything but I am sure if I ever do it will go up on my list. This has gone down on my list because the jobs that they used to have like going to a store to take pictures are barely ever available now. Now they are tasks that require 20 minutes of talking to people or buying things which are things I do not enjoy. Once in awhile there are still surveys or easy tasks available. They are also having trouble with PayPal and you now need $50 to avoid paypal fees in the past there was no minimum cash out. I have cashed out almost $100 this year so I hope that it goes back to the way it was in the past. You will need to have data on your phone if you use this as many of the tasks need to be done in store. I don't use this one that much just because the surveys pay a little bit less than other sites for the time. The advantage is you only need $10 to cash out to paypal and there are no paypal fees. That is the end of the current top 10 list. Once I cash out $1000 dollars for the year a new post listing how much I earned from each site will be available.